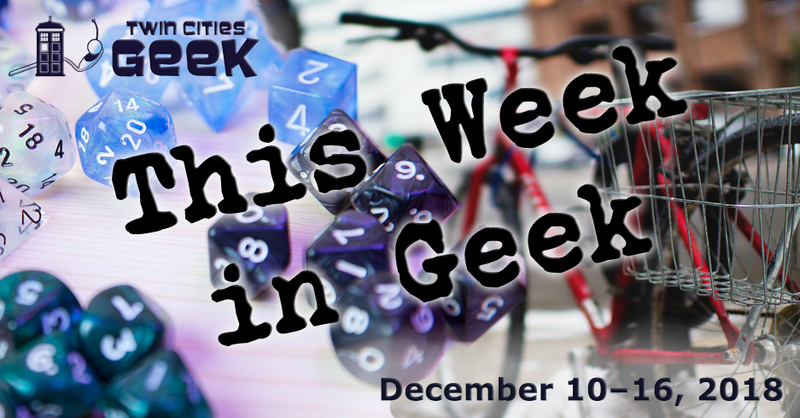 Welcome to This Week in Geek, your guide to events of interest to the Minnesota geek community for the week of Monday, December 10th to Sunday, December 16th. When: Monday, December 10th at 6:30 p.m. When: Tuesday, December 11th at 5:00 p.m. When: Tuesday, December 11th at 6:30 p.m. When: Tuesday, December 11th at 7:30 p.m. When: Tuesday, December 11th at 9:00 p.m.
A cult holiday horror film will be on display for the price of a dollar at the Alamo Drafthouse this Tuesday. This VHS Christmas-horror film is coming to town, oozing with blood, stop-motion beasties, ax murders, and other holiday fun. Check the Drafthouse’s website for other holiday movie events this week, including showings of Home Alone and It’s a Wonderful Life. When: Wednesday, December 12th at 4 p.m., 7 p.m., and 10:00 p.m. The Star Wars Holiday Special is a sort of bizarre cultural artifact that certain segments of the geek community need to see, and the Bryant-Lake Bowl has been screening it every winter for 12 years to benefit Toys for Tots. Admission to either of Wednesday’s showings is one toy for a tot. Experience Wookiee Life Day in all its glory, and see what George Lucas wanted destroyed for decades. When: Wednesday, December 12th at 5:00 p.m. Enjoy a night of holiday cheer hosted by Minneapolis book publisher Coffee House Press with cookies, treats, beer, wine, books, DJ sets of deep holiday cuts, prizes, and gift wrapping. This event is free and open to the public; if you can, bring cookies to share. When: Wednesday, December 12th at 7:00 p.m. When: Thursday, December 13th through Saturday, December 15th; starting at 5:00 p.m.
Illumination is a multi-day event hosted at the Science Museum of Minnesota focused on light, with a variety of opportunities for learning, fun, and slime creation. Events will include the production of glow-in-the-dark slime, a glowing igloo, releasing snowflakes into a life-size snowglobe, lighting your way with a flashlight, and learning more about light. There will be glow-in-the-dark cocktails on hand for the adventurous. Ticket prices vary with age and membership status, but adult tickets for nonmembers are $18.95. This event will continue throughout December. When: Thursday, December 13th at 6:00 p.m. When: Thursday, December 13th at 7:00 p.m. When: Thursday, December 13th at 7:30 p.m.
Raise a glass to local history at Waldmann Brewery & Wurstery, a local purveyor of beer and wurst with a historic flair. This monthly series focuses on specific areas of local history, allowing participants to learn while savoring a pint of beer made in a 19th-century style. This month’s program is “Noticing the New Deal,” focused on what happened to Minnesota as a result of the New Deal. This is a free event, and registration is handled on a first come, first served basis on their website. When: Friday, December 14th at 6:00 p.m. When: Friday, December 14th at 6:30 p.m. When: Friday, December 14th at 7:00 p.m. When: Friday, December 14th and Saturday, December 15th at 7:30 p.m. This year’s production of A Klingon Christmas Carol continues this Friday and Saturday night at the Historic Mounds Theatre in Saint Paul. Presented “in the original Klingon with English supertitles,” it will teach you the true meaning of honor in the face of the long night. General-admission tickets are $18, with VIP tickets for $35. Seating is reserved, and some performances sell out, so advance ticket purchases are recommended. When: Friday, December 14th at 8:30 p.m.
Support and celebrate your local comics book scene, and learn just how jam-packed with talent the Minnesota comics community really is. See a wide variety of local comic artists, and customers who make purchases from these highlighted creators will receive 20% off their Hot Comics purchase for the day (but not Hot Toys or Slideshow products). See the Facebook event page for a full listing of artists. When: Saturday, December 15th at 1:00 p.m. The Parkway Theater will be screening this Tom Hanks-holiday classic on December 15th, for a family-friendly trip into the uncanny valley of the early 2000s, with gorgeous CGI renderings of snowy landscapes, and a trip to the North Pole to meet Santa Claus. Presale tickets are $5 for kids under the age of 13, and $7 for people 13 and up. When: Saturday, December 15th at 1:30 p.m. and 7:30 p.m.
Support great local geeky authors and local causes at once at the L Spot’s first Queer Author Holiday Book Sale & Fundraiser, raising funds for Reclaim (an organization focused on increasing access to mental health support for queer and trans youth) and Avenues for Homeless Youth (an organization focused on emergency shelter and short term housing for homeless youth). There will be authors reading from their works (see the Facebook page for a complete list) and a used-book sale with 50% of proceeds going to support these organizations. When: Sunday, December 16th at 10:00 a.m.
Come on down for a day of local art and check some more geeky or artsy friends and family off your shopping list. This event promises free fun, parking, and refreshments, and will include a charity raffle. So come on down to check out great handmade local gifts, toys, arts, and more. When: Sunday, December 16th at 10:15 a.m. and 11:15 a.m. When: Sunday, December 16th at 12:00 p.m. When: Sunday, December 16th at 12:30 p.m. Gender Jam—a meetup group for trans, gender-nonconforming, questioning, and intersex youth—will be meeting up for an afternoon of community and fun. This week, Gender Jam will meet up for movies and crafts! As always, bring your permission slip if you are under 18. When: Sunday, December 16th at 5:00 p.m.